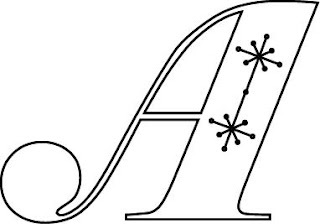 This letter A is in Garamond, the same font as the blog is now in...and I like that it's wide. 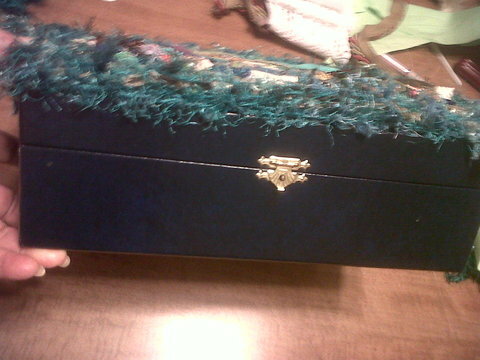 The next round in Basically Beaded round robin is completed, boxed, and ready to be mailed. 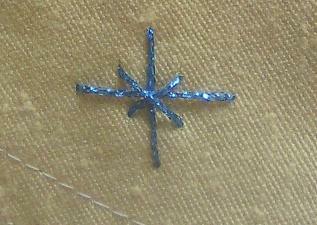 and this little blue flower and pearl seam. A couple of years ago...perhaps even three...I designed a couple of shadow applique quilts for teaching; and I still use them in my college classes. 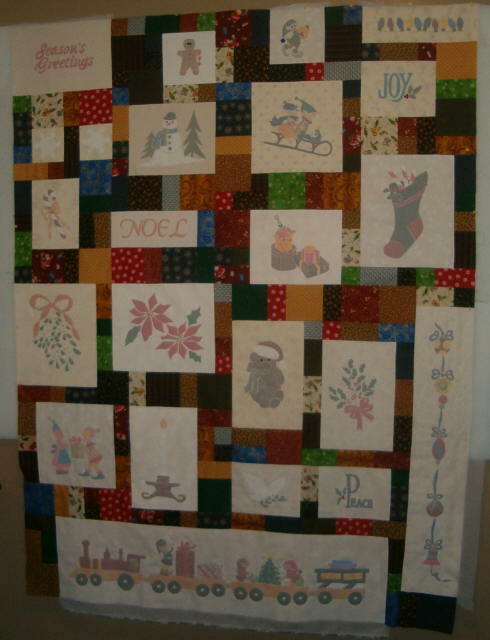 One was a Christmas quilt filled with lot's of holiday memories...and when I brought it to the HGTV Message Board Group...I called it Christmas in July. I think that's the month we started the quilt process. 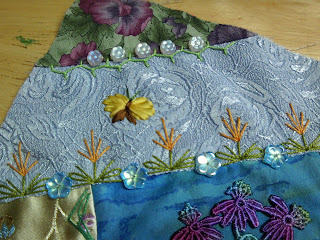 It is still in the same state as this photo shows...still needs an outside border! Oh, I have the borders...all cut out and in the basket with the quilt center...attaching them is just way down on my priority list. 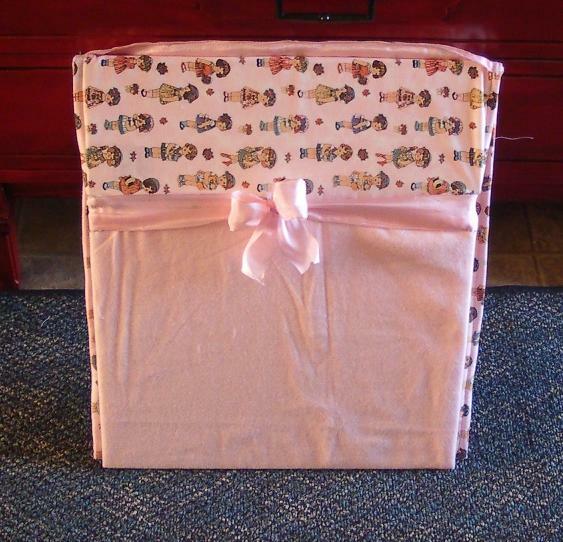 The second quilt I mentioned...Bunny in the Pink...is a complete top...and has been basted together...and I will be hand quilting it. 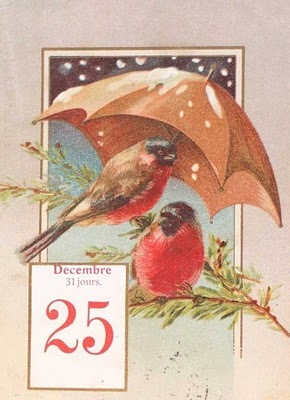 So, Christmas will wait. 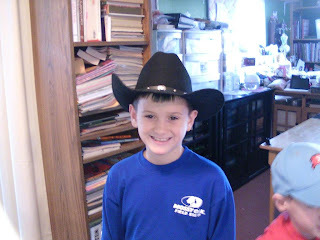 And Luke is the youngest of the three...and he is the most adorable little angel! And, yes...behind both the boys is my sewing/beading/crafting...."living" room. Odd that the table is cleaned off...but that is because we all needed a place to do gingerbread houses later in the day. And, all the "stuff" that is usually there...is piled up on the cutting board table behind it! I call it organized confusion! and a dragonfly or several...then it will be ready to mail next week! I'm still playing around in Illustrator...so, here'a a couple of monogram motifs for you. Just copy and save; resize with whatever photo software you have, as they are jpg files. 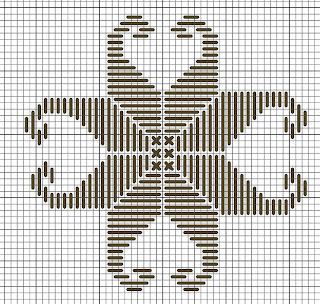 This one has a nice wide area for stitching...so if you didn't want to include the snowflakes, how about some spiderweb roses...or lazy daisy flowers...or a string of Christmas ornaments...or whatever you can dream up to fit the individual who's initial you are stitching. 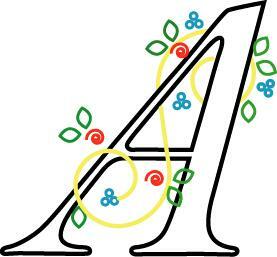 Hmmm...A is for Aidan...perhaps I should just put hearts! 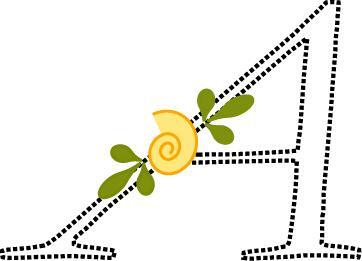 I think he could be candidate for embroidery satin-stitch, chain, or red-work outline only...or applique. Just size as you desire. The little ornament could be replaced with something else..like a little bell, or a bead...or....??? Today, I'm at my daughters...Buddy (my cocker spaniel) and I spent the night...so we are watching Aidan open her Christmas presents today. No stitching...but here's a Merry Christmas wish from me to you! Hope everyone has a really good day today...whether you celebrate the holiday or not. 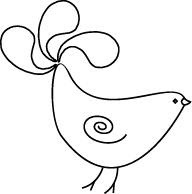 Here's a little birdie I drew in Illustrator. I've got to find the time to read the instruction manuals...instead of just scanning the book...so I can get better...and faster! But, I don't have time to read! I could be stitching! I've been playing around with Illustrator again...and it is so frustrating! 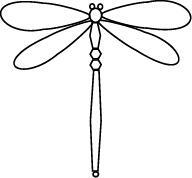 But, I managed to get a couple of very simple little dragonflies drawn. 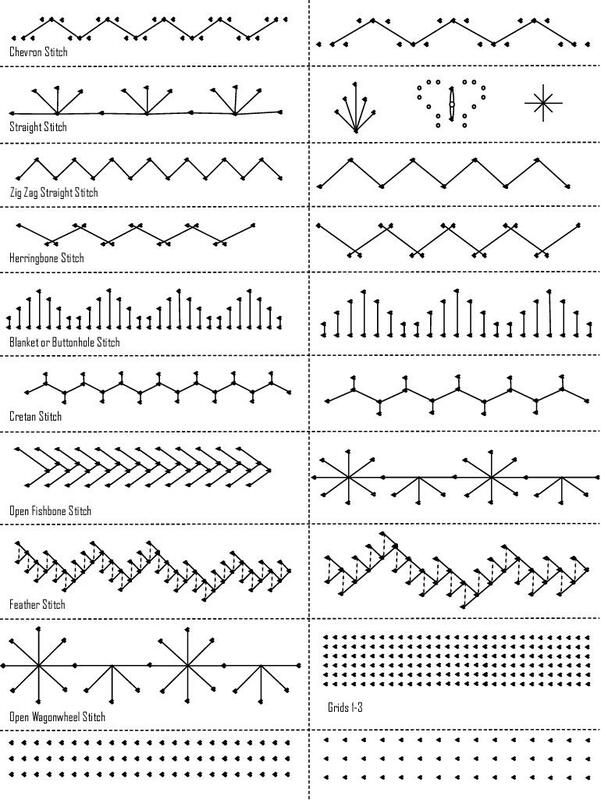 Perhaps you can use these as embroidery motif patterns. I am going to enlarge them and use the outline as a base for some beading I'm going to be working on next year. Of course, I'll let you know how that goes too! 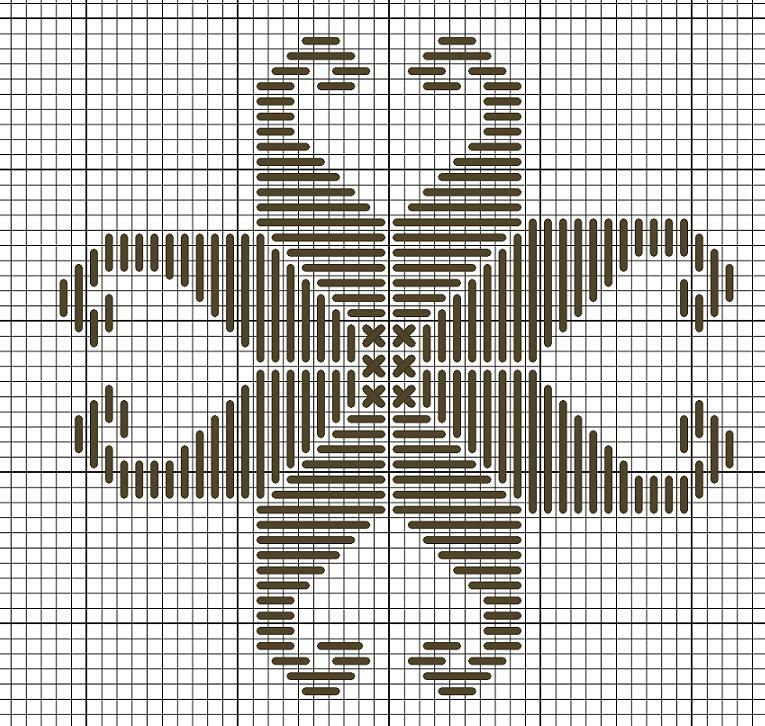 Here is a little motif...done in long stitch for you. 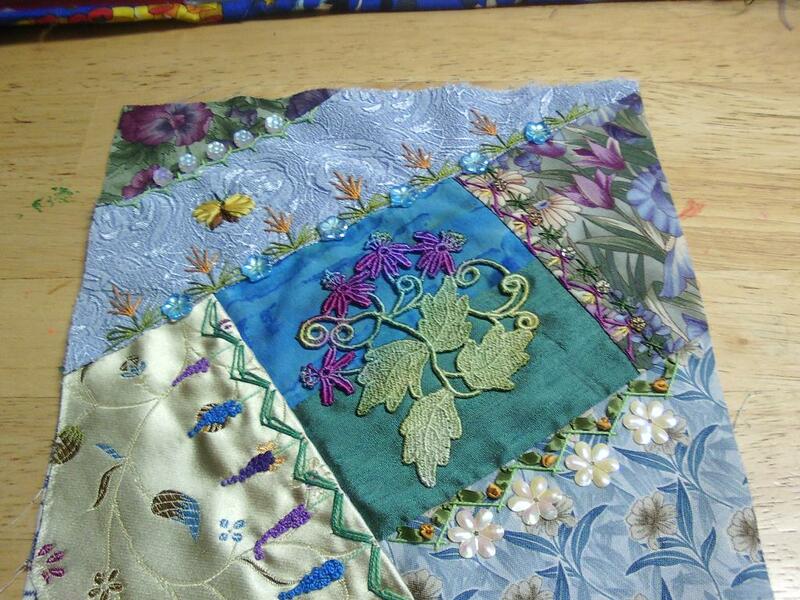 Use waste canvas for crazy quilt blocks...or stitch a few up for the next patch you create. Alternate versions are loaded in the file sections of the Shawkl_Blog_Files. 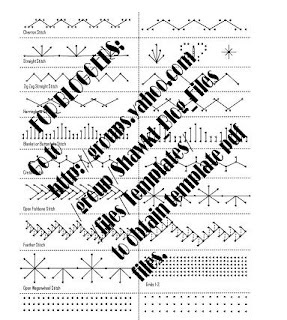 Make your own graph paper...and templates! Here's a really great site for making your own graph paper. 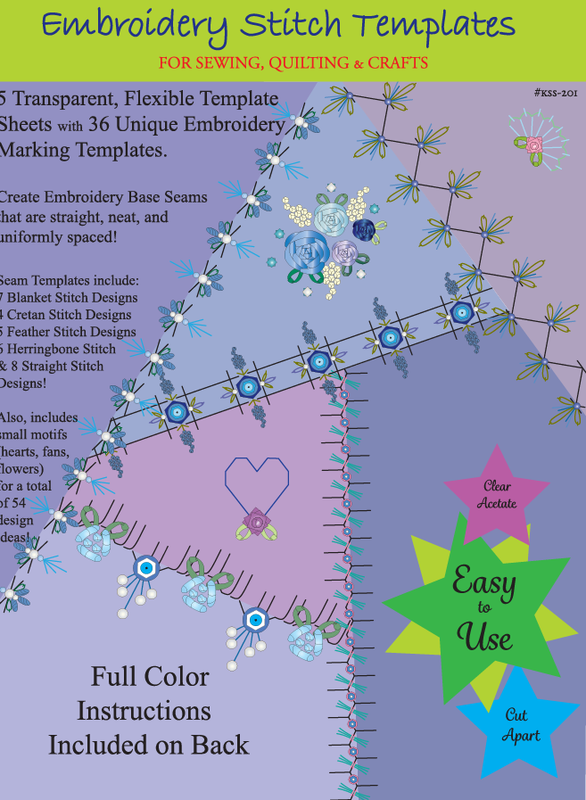 Then you can doodle and create your own stitch templates! 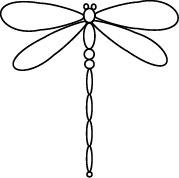 Remember to draw dots every location your needle enters the cloth! Go to the site...scroll down and select the type of grid you desire...square, circular, dot, etc. Then download the pdf file to your computer for future use. Print...and start doodling! So, check out all the different types! You can control the size of the grid also...by changing the number of lines to the inch. Eileen has finished her blue box...and I promised to share photos when it was done. 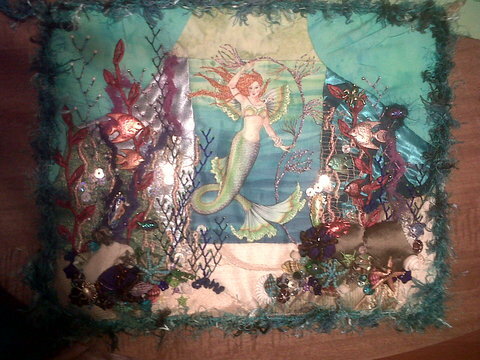 I mailed the mermaid piece to her last month...and you review the progress of the top by looking through the tags: blue box. Here is how she finished off the top, after adhering it to her box. 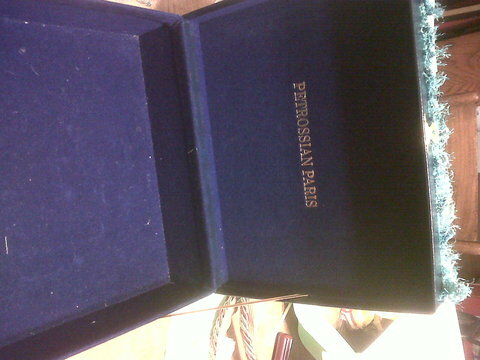 And, here is the box from the front...isn't that a lovely little clasp. Oh, and here is the inside of the box...isn't that nice...it was just screaming out for a nice stitched lid...so I was so glad to help her out with the project. Woot! Woot! 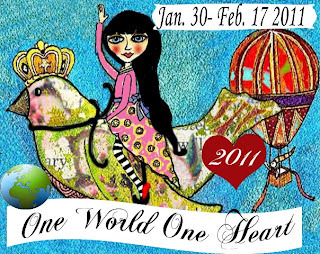 The One World One Heart Event Returns...One Last Time!! 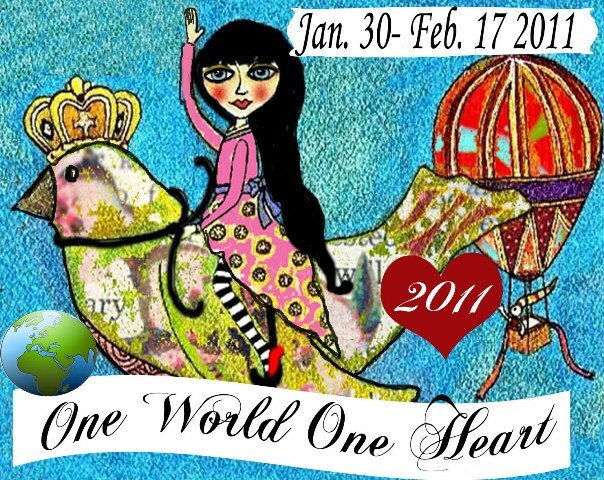 Announcing the FIFTH and FINAL One World One Heart Event! So, if you are blogger.....and want to spend a relaxing few hours cruising around the world...in blogland! Check back here on the 30th of January 2011 to see what I'm giving away...then go over to the OWOH post (I'll make sure you have a link that day)...to start your worldwide journey! And...if you have an active blog...and want to give away your own prize that day...and get in on the fun...check our the OWOH rules here! 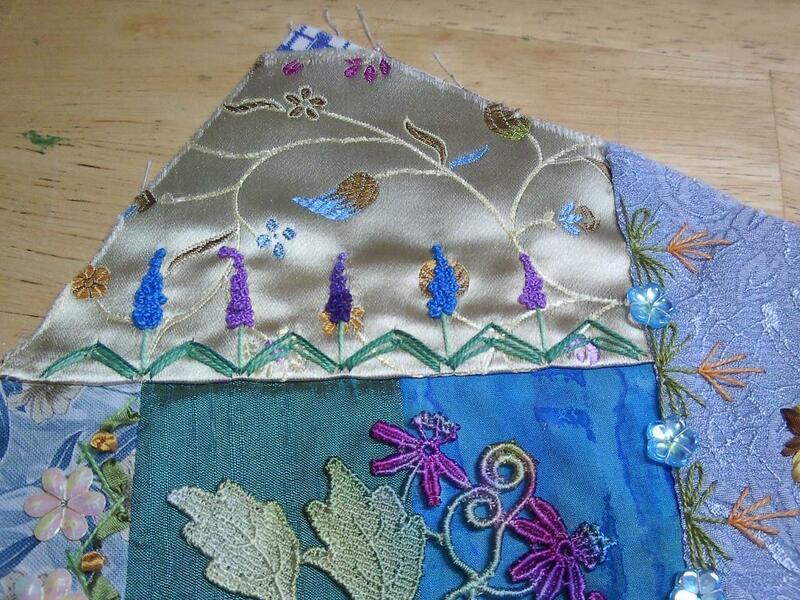 This little seam is deceptively basic...but look how wonderful it is with metalics and different colors. Reminds me of springtime! And in this cold weather, that is a good thing! 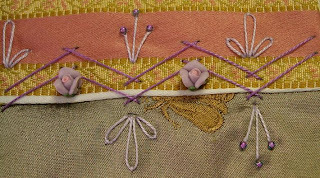 Of course, you could also add the daisies to the opposite side to increase the depth of the stitch...but, sometimes you just need a simple little stitch (with a little bling of course)...that does not "intrude" on a neighboring patch....so, I've only make it one-sided. This stitch begins our journey with the Chevron base stitch. The chevron base and these little "stars" are part of the latest template. 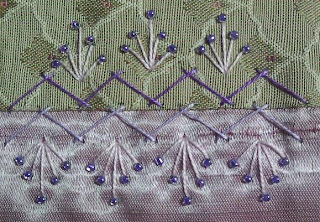 The design of this combination seam reminded me of little snowflakes...and would be great in metallic threads. 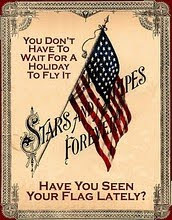 If you enlarge the star...you could also use it as a motif. Here it is stitch in metallic fiber...about 1 1/5 inches tall. I have created a new template...and the next few stitches in TDiTM will use this one. To make it...and the other templates (which I have re-drawn)...as easy to access as possible...I also started a Yahoo Group so you can access the files section there if you are a follower of my blog. Go to Shawkl_Blog_Files Yahoo Group. If the link is broken, you can go to Yahoo.com and search in the group for Shawkl_Blog_Files. You can request to become a member...(so I can see who is using the templates...and keep spammers from messing with the site) and I will approve your request. After that...you can get the files and download them...no cost as usual! Just enjoy them! 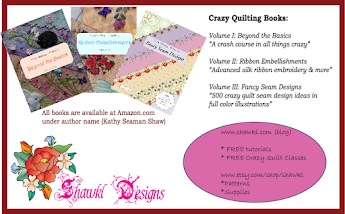 Or, if you don't want to follow the blog or join another group...you can purchase the templates at my Studio. And, I'm also offering the set of completed template stencils on the Studio...yep, I will print them, cut them apart, and punch all the little holes out for you!!! But, my time is not cheap...LOL! It really is a great deal to get the patterns and do your own. Especially if you join the group...since they are free there!! 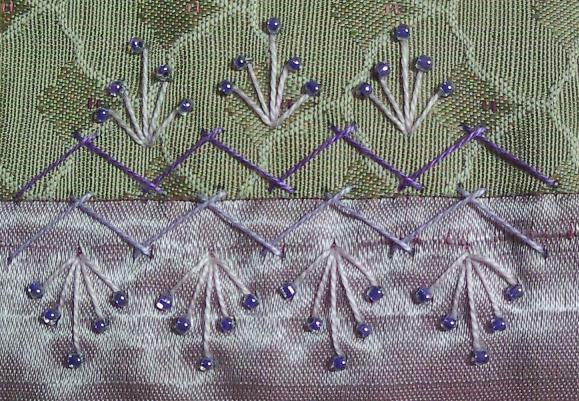 And, since the group site is created...if you want to share photos of your seams...feel free to post them. You are also welcome to ask me questions...and to post about the blog. I will try to add tutorials and such to the Group site as well. ETA: 06:15 AM....I don't know what I was thinking! Starting a group TODAY...when my grandkids are coming over for Christmas dinner! Yikes! Please be patient with me...I'll get back to this laptop just as often as I can to approve your memberships! Big Hugs to all of you! Very busy today...cleaning and baking...but here is the last of the double herringbone seam treatments for the blog. Next, we move on to....chevron base stitch. Tomorrow, I'll post some more info on the templates too!! The Greatest Fruit Cake on Earth!!! Okay, I know...I hear you say "there aren't any great fruit cakes". Wrong my friend....this one is so great, my Mom hides it so we can't find it! She makes a batch each year....around Christmas time...and then, we put several loafs in the freezer. Around May or June...we can't find any of them! She has hidden some! Then on Thanksgiving...she pulls one or two out to eat! So, today..we made a new batch...and while it was cooking...what does she pull out and cut!!!!!!! I kid you not...she baked this last year! And, it was just as great today!! Use butter to grease an angel food cake pan or three large loaf pans. Cut brown paper (or parchment paper) to fit the bottom of the pan, and grease that with butter too. Set pan aside and preheat oven to 275 degrees. Using a sharp knife, or kitchen shears…cut dates in half, and cut candied pineapple into big chunks. Reserve a few whole cherries and whole pecan halves for decoration (optional). In a medium bowl: Mix eggs and sugar until frothy. Pour this mixture over the fruit/flour mixture. Mix until each piece of fruit is sticky with batter. Add pecan halves. Place mixture by the handful into the cake pan(s). Press the mixture down into the pan to remove any excess air. Fill the pans, as the cake does not rise much. 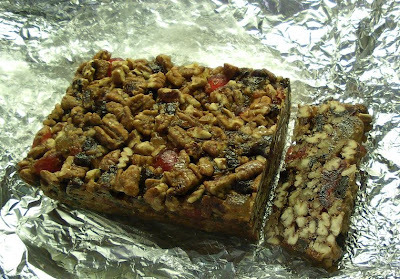 Decorate the top of the cakes with a few cherries and pecan halves if desired. Bake angel food cake pan for 1 to 1 ¼ hours…bake loaf cake pans for about 1 ¼ hours. 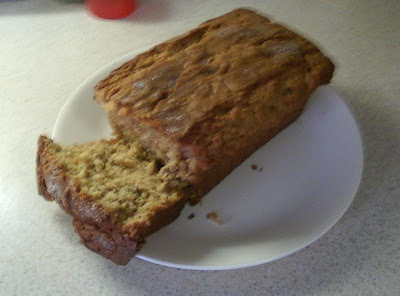 After recommended baking time…check the cake. If it looks slightly undercooked…leave in the oven…but Turn the Oven Off. Keep an eye on the cake. When done, remove from oven. Slice and enjoy! Great to make ahead and freeze..they last over a year in the freezer. Thaw and serve. This is a busy week....it's the last week of school before the holiday break. Aidan has only half a day on Friday, and then doesn't go back to school until the 4th of January! So, she and I will have loads of things to do during that time. 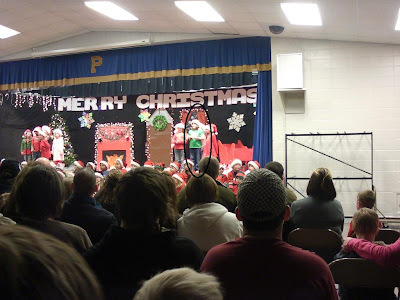 One big event this last week of school was the Christmas play...and here are some "grandma photos" to share with all the other doting grand-mothers following the blog!! 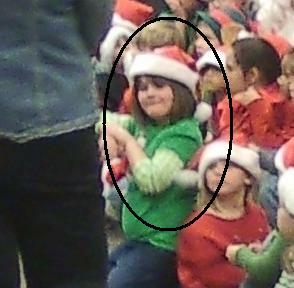 Her contribution was to help sing the "Santa's Coming To Town" song. The program was typical of what you might expect from about two-hundred first and second graders....loud, lively, loud, cute, loud....and, did I say loud? Here she is...waiting to follow her fellow classmates back into the halls at the end of the performance. I had to work my way up front to get a decent photo...well, as decent as my cellphone would take. So, wishes for a great holiday season to everyone...and go hug an Elf! And, this post is just in time for Christmas Day baking!! Or, you could do this for any time...just plan ahead as it takes 10 days!!! (really just a few minutes each day...and it tastes great...and is easy breezy). First you make the starter...then ten days later...you bake the cakes. Sometimes, we make the starter...and then on the tenth day...we divide it up between the "girls" in the family...instead of baking on the 10th day. And other times...we bake the entire starter off. Usually at Christmas my mom bakes a lot of these...wraps them in clear plastic wrap, then in tinfoil...and freezes them. She gives them as presents too! The starter recipe...and dry ingredients in a little jar...with a bow...and a copy of the recipe is a good little gift too. You have permission to copy the recipe...and you will not be sorry that you did! I promise. Day Two through Five: Squeeze the bag! Check the bag throughout the day. It is normal for the batter to bubble and expand with air. If the bag expands a lot…crack the top and let the air out…reseal the bag. Day Six: Add 1 cup flour, 1 cup sugar, and 1 cup milk. Squeeze the bag! Day Seven through Nine: Squeeze the bag! Check the bag throughout the day. It is normal for the batter to bubble and expand with air. If the bag expands a lot…crack the top and let the air out…reseal the bag. Combine the starter with 1 cup sugar, 1 cup milk, and 1 cup flour. Mix well. Divide the new starter into 3 parts…. This is your new starter…and the beginning of a new DAY ONE. These can be given to friends along with the baking recipe below…or you can use the entire starter to create multiple cakes. Pour all ingredients into a large glass or plastic bowl. Mix well with wooden spoon. Butter four loaf pans or one bundt style cake pan (we use spray Pam instead). Sprinkle a little cinnamon sugar in the bottom of each pan (we put about 1/2 cup sugar and 1 teaspoon of cinnamon in a bowl for this purpose and just get a pinch to sprinkle all over the bottom and sides of the loaf pans). Makes 4 loafs...or one large bundt cake. Fill each of the loaf pans about 2/3 full with batter. Sprinkle a little cinnamon sugar on top. Bake at 325 for about 1 1/4 to 1 1/2 hours…or until a toothpick comes out clean with inserted into the cake middle. These are excellent to freeze ahead of time, and just thaw one out when it is needed. They keep for about 6 months in the freezer...or at least, we have eaten all of ours by that time!! The recipe has a lot of oil...and I think would be a good candidate to substitute some of that oil with applesauce instead. Shhhhhhh...don't tell mom! Yikes! It's Give-A-Way Day....Win BIG!!! Want a chance to win from over 300 different bloggers and sites??? Find a comfy chair...grab a cup of tea...and a cookie...you might be busy with over 300 sites offering up some great give-a-ways!!! Today, I finished up a flannel board for Aidan. 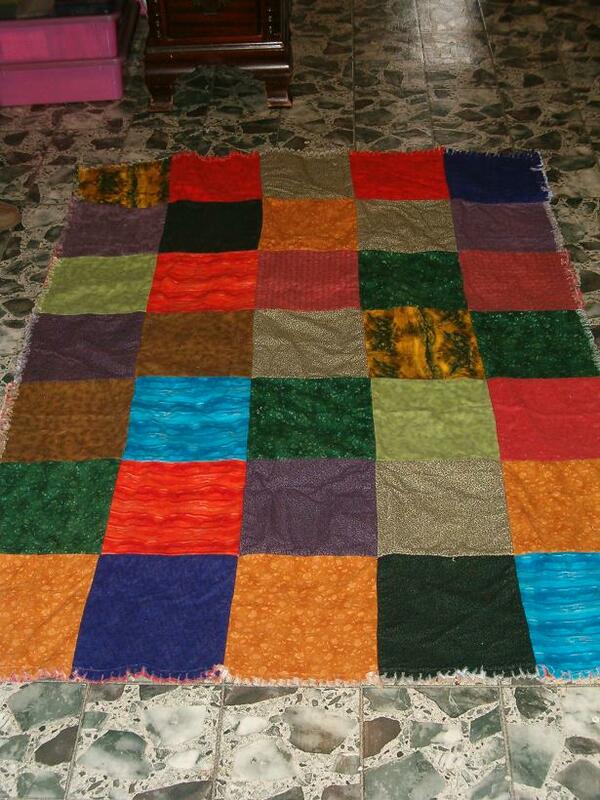 And, I completed the rag quilt for Chase yesterday...so both grandsons will now have a quiltee under my tree! Yeah! Rather than do a quilt for Aidan, I decided to do something with the Paper Dolls fabric I bought last year. 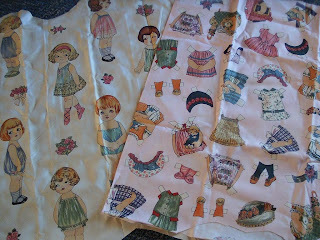 If you go searching for this...it is made by Windham Fabrics, called "Paper Dolls", and designed by Sheryl Rae Marquez and comes in a variety of color ways. I simply ironed fusible to the back of the fabrics...and cut out each piece. Then I peeled the paper backing off...and ironed each object to flannel. Then each was cut out...and I did not cut out the "tabs" on the clothing...because they are not needed for a flannel board. An even faster way would be to iron the entire fabric...once fusible is applied...to the flannel...THEN cut out the pieces only once. However, I was afraid I would not have enough flannel for all I needed to do...so I choose to cut the fused pieces out...then apply them to the flannel...then cut them out again! Actually, it only took a couple of hours...still, it could have been more efficient if I had not be concerned over the amount of flannel I had on hand. 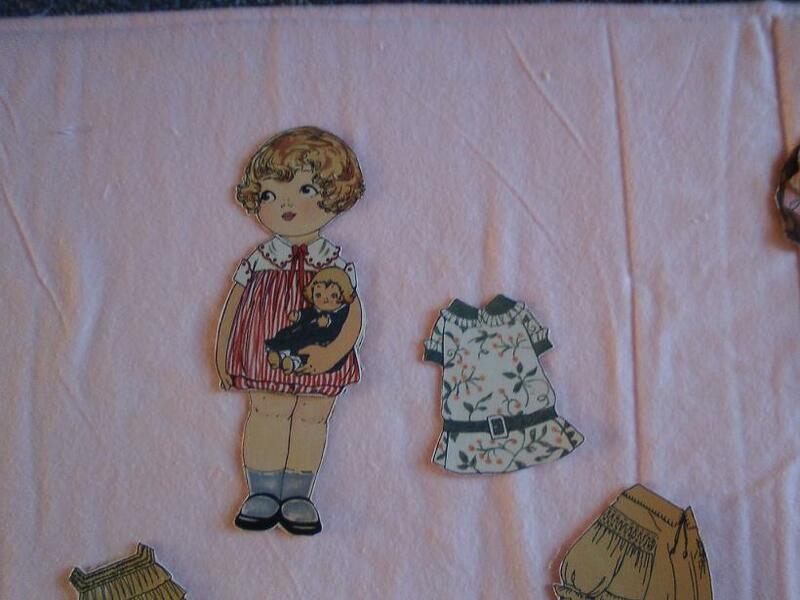 This is one of the dollies...wearing a new dress...and a second is under consideration for her next fast change! The flannel board was easy...just a few big squares of fabric and some cork board. 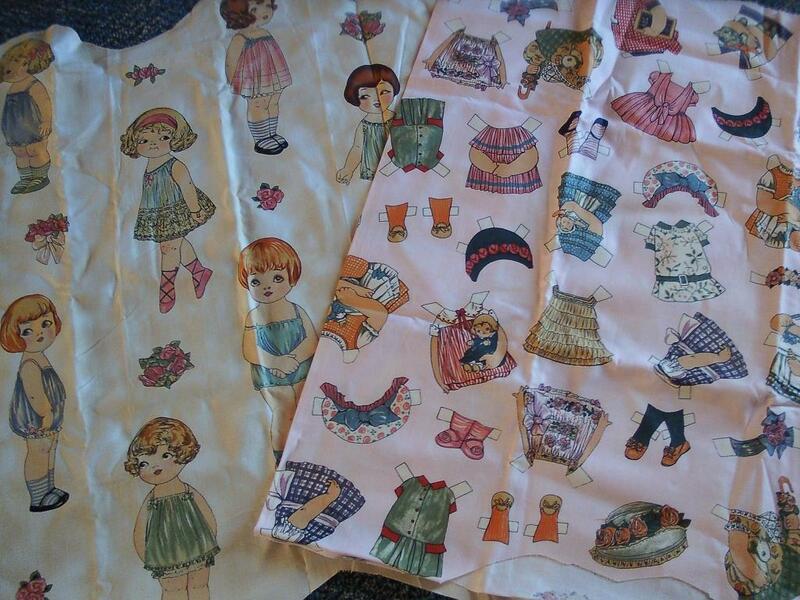 It is a tri-fold design...here is the inside fold...with pockets for the dolls, dresses, shoes, and hats. The pocket is a ziplock baggie with blanket edge sewn to the top and bottom...fold the bottom up about 2/3 of the way...and stitch to the inside fabric before assembly of the case. The zip part of the bag was cut off. And...here is the flannel board opened all the way...with some of the dolls and accessories on top. I changed my mind on the front flap...and had to make it longer...which meant it was in two parts. Hard as heck to get that last piece on because it would not fit under my machine's throat! I covered up my horrible seam work with a ribbon. I'm sure Aidan will not mind...but you should plan better than I if you make one! Lot's of Love!! Here's the next little double herringbone...are you getting tired of these yet? We have a few more...then we'll move to another base stitch. Want to guess which is next? Only 22 more stitches and we will have our Two Dozen in Twelve Months completed...even though it too longer. The proper name should have been Two Dozen in Two Years! !....but, life does happen...and mine is always Nuts!! I bet yours is too!! These little butterflies are really cool! 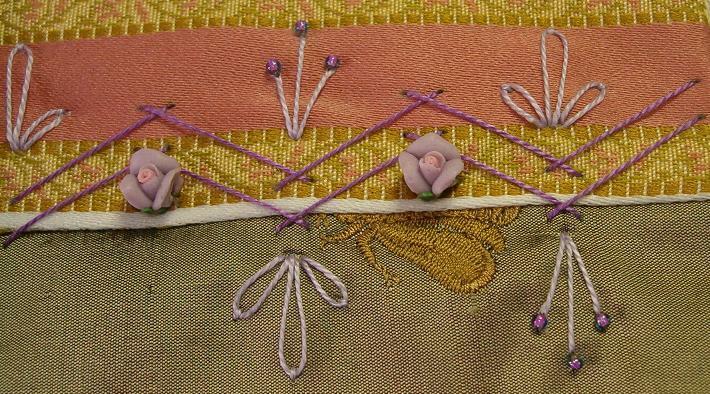 I actually use them mostly for little motifs...and stitch them in 2mm or 3 or 4mm silk ribbon. But, they are also cute on this seam treatment...so I think they will be used more and more! Hope you enjoy them too! The little green "V" is freehand stitched...and not part of the chart. It is intended to be antenna...and can be stitched or left out. Simple, easy, quick! 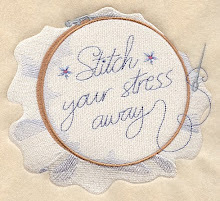 My kind of stitching! Isn't this the cutest! I have not used sequins behind my beads for a little while...and I'm in love with them again! So quick...and so dramatic! Loving it! 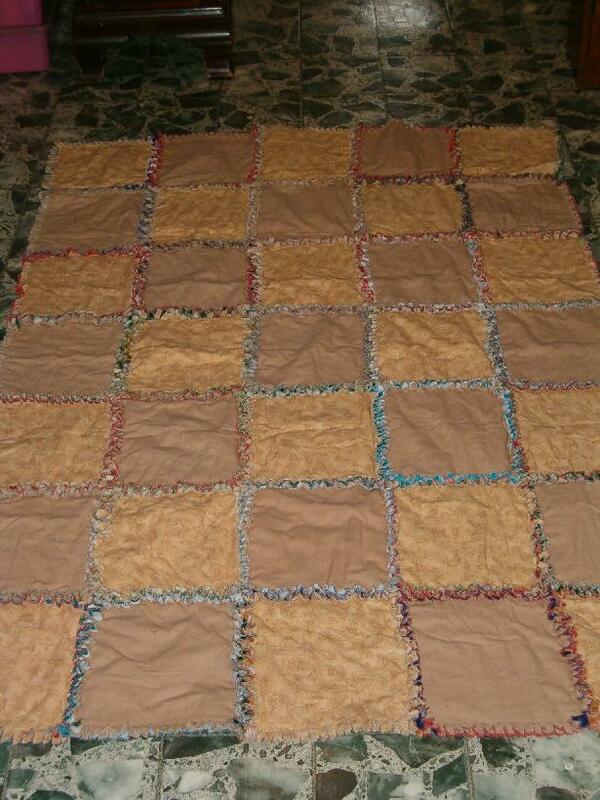 Here is Luke's rag quilt. 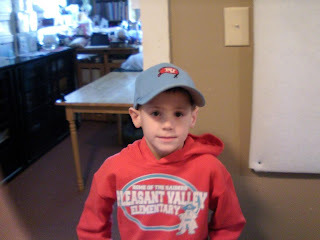 My grandson Luke is the second boy. You know the story..he always seems to get left out. Chase, his brother, was the first grandchild...and was doted over. Aidan, their niece, was the first grand-daughter and is certainly a Diva in that role! ..and Luke is stuck in the middle. Chase got a baby quilt...and Aidan helped me make a doll quilt and pillow for her...but Luke is still waiting for something sewn by Grandma. 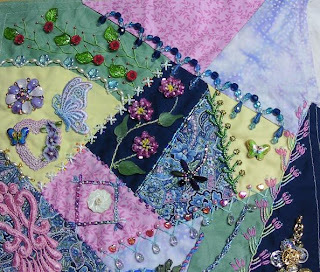 I want to make his quilt super duper special...And, although I had loads of ideas this year to make this happen...I never could settle on one of them long enough to select fabrics. Something "better" always seemed to come into my head. So, when December arrived...I was feeling like a pretty bad grandma. 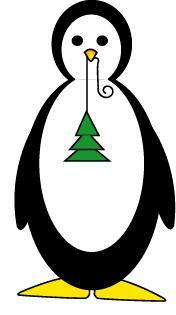 And of course, there isn't enough time before Christmas now to do a really special project. I'd love to complete a hand quilted bed-size project for each of them...but, that will wait until they are older...at least in middle school! What I really needed for Luke was a quilt he would snuggle up with. One that he could carry with him in the truck...without his mom worrying too much about it "getting dirty". It needed to be special...but not TOO special...if you know what I mean. He is almost six...so still take naps...but is a 'big boy'...so no baby themes! Then, in a flash...it came to me. 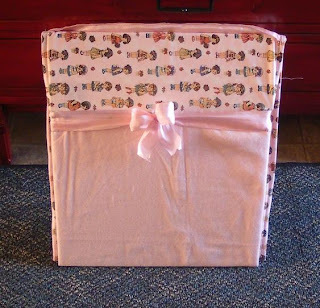 He needed a flannel rag quilt...bigger than baby...but not quite bedsize! And even at the first week of December...I can get a rag quilt done! Yeah! They are the very easiest of quilts to create. It took a day to cut out all of the blocks (9 1/2 inch flannel squares). Then, the next day...I sewed the whole quilt together...and washed it for the first time. If you have never made one...try it. They are super soft...all flannel! Great for a crawling baby...or for a bed or napping spot! Layer 3 squares of flannel for each block. The top one faces front...the bottom one faces back...and the middle doesn't matter which way it faces. Treat this layer of 3 as one block...and sew it with the next block (there will be six layers). The seam allowance is about an INCH...so easy to sew up. It does not have to be exact. When the rows of blocks are all stitched together....snip each seam allowance every 1/4 of an inch...and cut almost to the seam line...but do not cut your seam! Sew around the outside edge of the entire quilt to keep those outside block layers all together...and snip the outside edge every 1/2 of an inch also! Viola...you have a soft and durable quilt to snuggle with! Every time you wash it...threads (LOTS of threads!) will come loose. 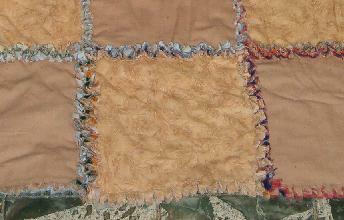 Over time, the seams look like chenille. Of course, that also means you will have lot's of threads in your lint traps...so keep those filters changed. 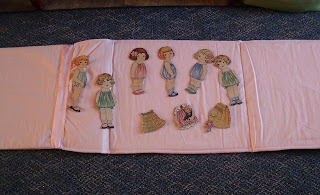 I had such fun doing this one...I might see if there is enough fabric for a rag quilt for Chase and Aidan this year too! See, here it goes again! !